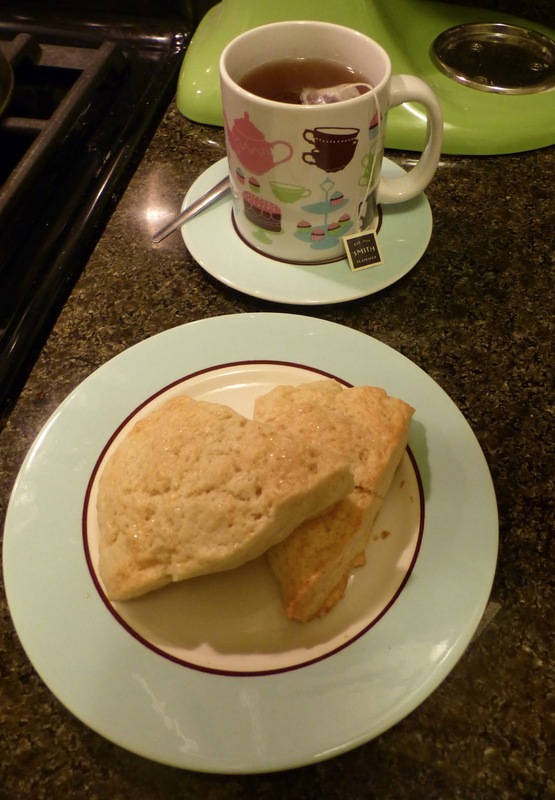 I was excited to make this recipe, since I love scones but have yet to find a good recipe. Well, the search is over! This was easy to make, and super delicious! Most scones are rather dry, but these were moist and crumbly. I was surprised when reading the instructions, since scones are related to biscuits, and I've only ever made biscuits by hand or with a food processor. TK has you using a stand mixer, which incorporates the butter more thoroughly. I used Plugra butter, and sour cream instead of creme fraiche. Although you must chill this dough twice before baking, with a little advance notice, these can easily be made the night before and baked off in the morning for fresh breakfast scones. I made sure not to overwork the dough, which was wet but easy to work with. 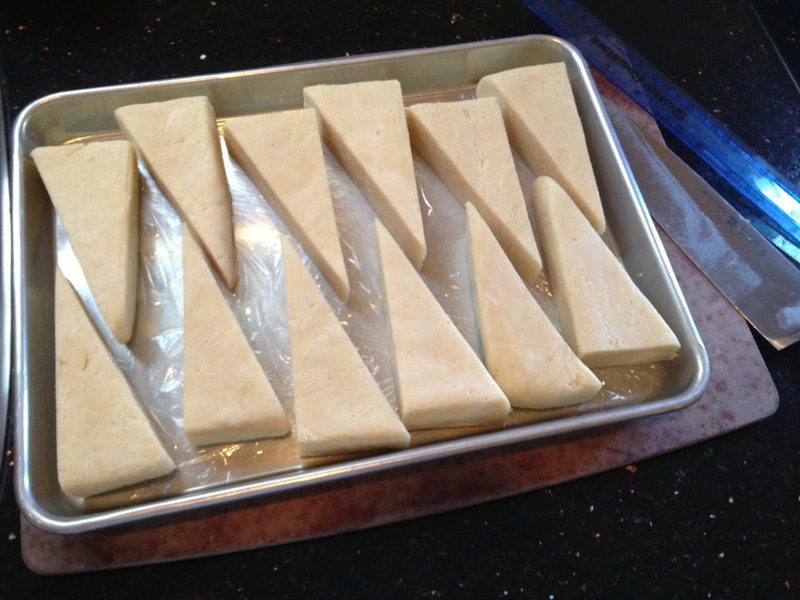 After the first chill, the dough was easy to cut into triangles as directed, and I got 12 scones exactly. I froze them for about 3 hours, then got impatient and had to bake them! Before baking, I brushed them with cream and sprinkled them with demerara sugar. Next time, I'll use more sugar, because I loved the sweet crunch on top! The sour cream gave these a tangy taste. They were crumbly, moist, and amazing! I couldn't stop eating them. After a few days, I could tell they were getting stale, so they really are best enjoyed immediately. With maybe the addition of some citrus zest or dried fruit, there are endless ways to make these. This will be my scone recipe from now on. I think they taste best with a cup of Earl Grey tea while watching Downton Abbey. If I bake anything, my family looks forward to what ever comes out of the oven to be scones. I have baked just about every scone recipe that has crossed my path. When I first baked these plain scones from the Bouchon Bakery book, my family was in heaven. I have to admit, I jumped ahead and began using this recipe when I first purchased this book. The ingredients for this recipe calls for cake flour, créme fraîche and lots of butter. Upon reading the ingredients, I knew these scones were going to be a winner and come out extremely moist. The outside has a wonderful crunch with the added large-crystal sparkling sugar and the crumb is moist with enough sweetness that we Americans like in our scones! This recipe was easy to read and quick to prepare. I do like that the butter is fully incorporated in the dough. It also makes it easier to handle since the dough is not dry like most other recipes. The technique of using one's palm is key as in past recipes I would handle the dough a bit too much. I never knew it could be so easy to whip up a recipe that would turn out as delicious as this. I always make the dough at night and freeze overnight then in the morning pop the scones in the oven. Loved the scone recipe!! The cake flour made them really light and delicate. I have to say that I do no like "rubbing in" the butter with the stand mixer. I prefer to rub it in by hand or with a pastry blender. I followed the recipe and started with the mixer and ended up finishing it by hand anyway. I added organic dried blueberries and they were probably the best scones I have ever made. Another winner!